At Zion & Zion, when it comes to writing web content, we’ve heard it all before… “Avoid writing too much, but don’t make things too short;” “Rank high in search engines, but don’t overuse keywords;” “Make sure your readers relate to your content, but avoid jargon.” Blah, blah, blah. Most of what’s out there is a lot of abstract advice, but not a lot of actionable advice. Writing website content can be a tedious task, but serves an extremely important purpose in today’s world. More than ever, users are relying on the web—from researching information about a service to providing you with reviews of a product you’ve been dying to try. However, in order to create quality web content, you have to learn the dos and don’ts of this important and ever-changing skill. There are countless articles talking about ways you can improve your web writing skills, but have you ever stopped to think about what you may be doing wrong? This article is filled with tips that will help improve your writing skills by pointing out the ten most common mistakes made when writing for the web. While some may seem more obvious than others, it’s important to keep all of these mistakes in mind before, during, and after you write to help increase the value and quality of your web content. Mistake #1. Writing for everybody. Writing to appeal to everyone isn’t convincing. The only way to write for everybody is to thoroughly impress hardly anybody. Users like something they can genuinely relate to by recognizing how it helps their specific need or by providing them with the information they were looking for. Get to know your users and establish a target audience. Put yourself in their shoes. Imagine what a typical day looks like and understand their demo, such as age, job, family size, interests, and hobbies. This information will help you determine your users’ needs and truly write content they find valuable. Whether it’s content to educate, convert, or entertain, stick to your purpose and keep users engaged and informed. Think about what you want your content to accomplish. Having a specific reason for your writing should link the user to your content, and then precede to close the gap by establishing a solution related to their needs. Mistake #2. Forgetting to do your research… thoroughly. Content developers can write about nearly any topic in the world. It’s part of the job. But how? Is it because they naturally know about every product, service, and industry in the world? Guess again. Do they simply read an article or two about the company and instantly learn the ins and outs of the business? Not even close. 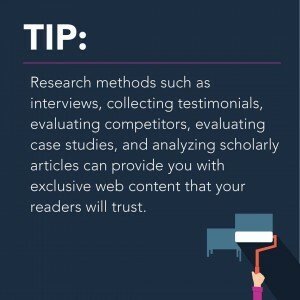 The ability to publish valuable, informative content for industries across the board is achieved through extensive research (and quality writing skills). It’s important to learn everything there is to know about the topic. For example, if a new plumbing business came to you for website content, you would begin by researching the company and their brand, then expanding to the entire industry, all the way back down to their core competencies and local competitors. With numerous websites just like yours battling for the top spot in search engines, extensive research is no longer an option, it’s essential. By arming yourself with a substantial amount of information about your topic, your web content could find its place on the first page of Google by offering quality content that can’t easily be found on a competitor’s website. 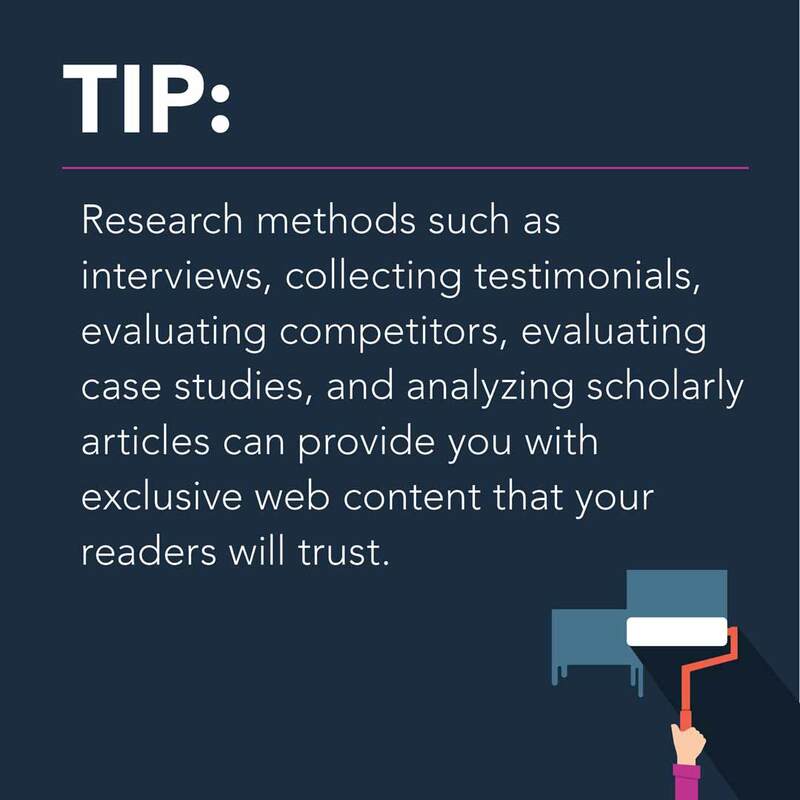 Research methods such as interviews, collecting testimonials, evaluating competitors, evaluating case studies, and analyzing scholarly articles can provide you with exclusive web content that your readers will trust. Writing predominately for search engines doesn’t work like it used to, because search engine algorithms are increasingly seeking to emulate actual users in their evaluation of what should rank. And frankly, even when it sort of worked for search engines, it often didn’t work for users. With continuous updates to the Google algorithm and the vast amount of information available on the web, there’s no reason to sacrifice the conversational feel of your content in favor of keyword stuffing. Since Hummingbird, the most recent update to Google’s algorithm, writing for search engines by going crazy with keywords doesn’t cut it. 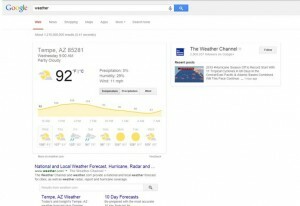 Google’s search results now focus on the intent of the user and what it is the user truthfully wants, rather than serving unrelated search results due to repetitive keywords. 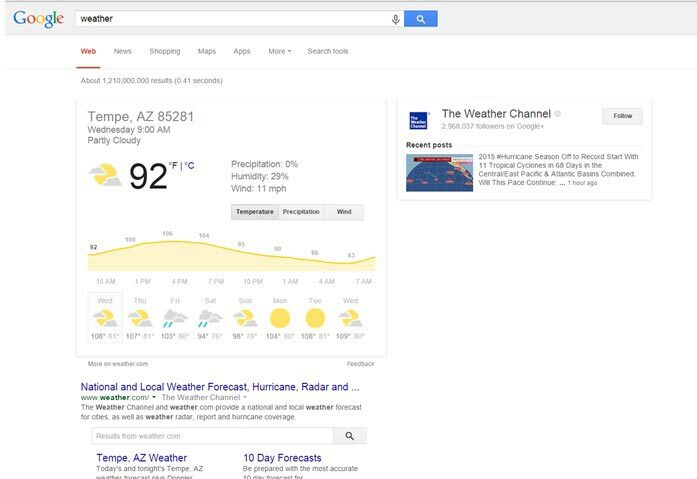 You can see that when I typed in the word “weather,” Google knew I was not necessarily looking for the definition of the word weather, but rather for the weather forecast in my area. Mistake #4. Over trusting spell check. While spell check might catch your misspelled words, there could be other grammatical errors and misused words that the red (or blue) wavy lines don’t indicate. For instance, there, their, and they’re—there is a difference! Unfortunately word processors don’t always catch these common errors. Spell check has also done its part in creating what many of us call “lazy writers,” discouraging the need to proof something just because there are no obvious error indications. Traditional proofreading is a technique that identifies and corrects mistakes in voice consistency and information organization in addition to grammar errors and misused words. Mistake #5. Rambling to hit a word count. Much like our keyword example, it’s not all about word count. It’s true that word count is something you should keep in mind, but it should never take priority over the purpose of your content. As you try to search the web for an ideal word count, you will notice endless answers from a variety of sources. The true answer to this common question is that there are plenty of factors that should affect your word count, so let the purpose of your content make that call. Style of writing—someone who blogs about a simple 3 step recipe will have a noticeable difference in word count than a blog post explaining the fundamentals and processes of traditional and digital marketing. The audience—who are you writing too? Will they read large amounts of copy or do they want to easily find an answer to a simple question by glancing at a few bullet points? Complexity of writing—the content can easily describe a topic in layman’s terms rather than needing an in-depth explanation that defines terms and explains complex processes. Visuals—web content that displays visuals may have additional copy explaining the details in the video, infographic, or image. I am not saying word count isn’t important, but I am saying that it shouldn’t always be your highest priority. 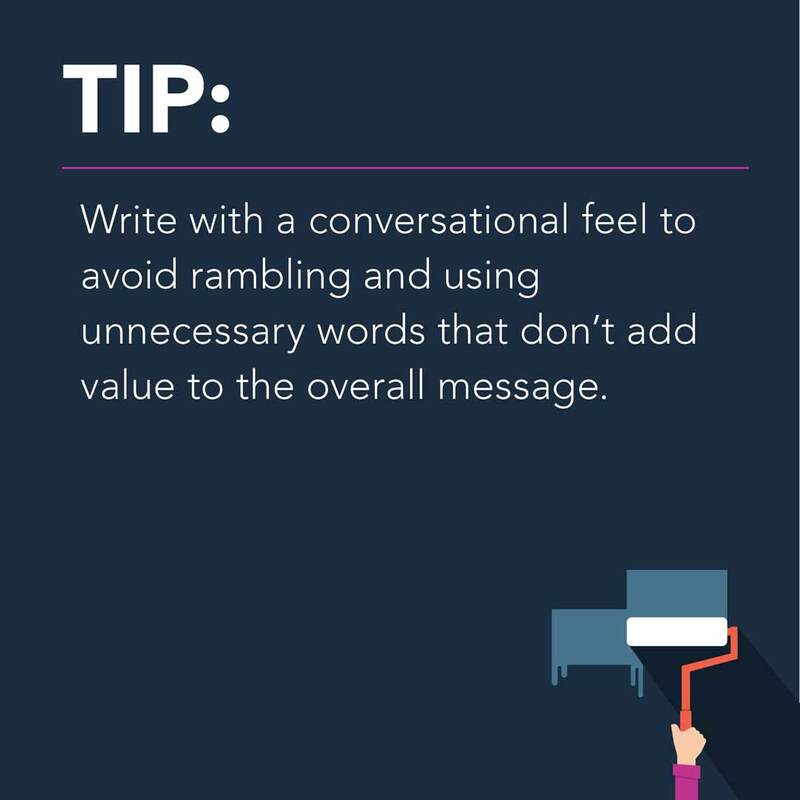 Write with a conversational feel to avoid rambling and using unnecessary words that don’t add value to the overall message. Mistake #6. Writing a “decent” headline. Don’t neglect your headline! Spend some time creating and crafting a creative headline that grabs the user’s attention and draws them in to learn more about what you have to offer. The headline should pertain to the main idea of the content, but sum it up in just a few words. Shoot for something that is short and direct. A well-crafted headline will fulfill the customer’s need to read more or move forward. Mistake #7. Trying to appeal to your audience with jargon. All content on your site should be clear; that’s obvious. Exclude the jargon and strive to deliver relatability. Keep it simple and to the point so users easily feel they have come to the right place. If you reference an industry term, always define it. Technical writing and industry terms can make a user feel lost or unqualified to continue reading. A potential customer could give up and refer to another website with less technical content, especially if they landed on your website wanting to learn more about a topic they knew very little about. Mistake #8. Sticking to the same old format. Keep the user experience consistent, but not with a boring, one sizes fits all template. Giving each page some personality and achieving the user flow you had in mind when developing a website can be achieved with content (whether written or visual) that grabs and holds their attention. As long as you’re not directing users to irrelevant pages with information that is unrelated to their needs, they will enjoy the creativity of your site and read more of the content you worked so hard on. Mistake #9. Don’t sound redundant. This mistake is often caused by over-explaining a topic. 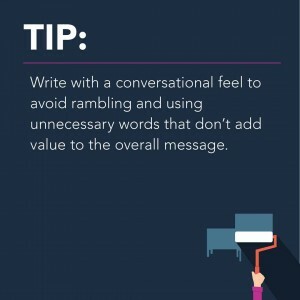 Write to communicate what you want your users to know. Our attention spans continue to shrink when it comes to reading web content. This means the need for content to appear clearer and more concrete continues to grow. If you’ve implemented a content strategy that discovered the needs of your users, related to their past experiences, and closed the gap between what they needed and how you can help them, then wrap it up with a strong conclusion. You can always come back and make adjustments after you see how users interact with your website through usability testing. The context of a page can sometimes be perceived and judged solely through the visual elements, such as videos and infographics. Depending on the written content and layout of the page, these visuals may better serve your users if you expand upon the written content, rather than simply reiterating what the written content says in a visual way. Each webpage should provide information on a single topic. 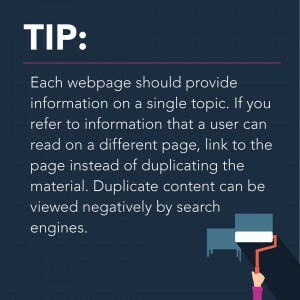 If you refer to information that a user can read on a different page, link to the page instead of duplicating the material. Duplicate content can be viewed negatively by search engines. Mistake #10. Once you’re done, you’re done. Wrong. Whether it’s website content or a blog post, your work isn’t done just because you’ve typed your final thought. Your website content can be tested to see if a user understands its purpose and if they interact with your website the way you intended them to. You can check to see if the content and or CTA (call to action) is encouraging users to move forward or if changes need to be made to improve the user’s journey throughout your site. For sharable content such as blog posts, you can always repurpose your content. Imagine spending hours writing an informative blog post about “The Top 10 Mistakes When Writing Content” and there it is, just sitting in your site’s blog roll waiting to be read. Instead, take action! Push the blog post out through social media or email, create an e-book or whitepaper out of your post to push through email in a different way; anything that will get your content seen and driving traffic back to your site. Be sure to refer to this guide when assigned your next web project. While I will agree it is important to know how to improve your web content writing skills, like experts in any department or industry, it’s also important to know how to avoid common mistakes.